Today is International Women’s Day, and I am celebrating. Whom do I celebrate? Gloria Steinem, Meryl Streep, Malala Yusufzai…ahaaa! I will start with the land of my birth—Pakistan. Havn't heard her name? Lets Google her. New Yorkers, she is also one of our own, a Columbia grad. I am not kidding. Meet Flight Lieutenant Ayesha Farooq. Watch her take off. No, she is not grounded in tradition. And she is not the only female fighter pilot. Here are some photos of many more, inducted in combat roles since 2006. There are over 300 women in the Pakistan Air Force alone. 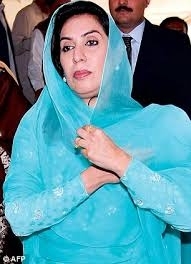 Fahmida Mirza was the Paul Ryan of Pakistan; Speaker of the Parliament from 2008-2013. The male members of the parliament elected a woman to preside over them! Here she is. Now tell me, does this woman with the dupatta draped over her head (the Pakistani hijab of sorts) look oppressed? Here is more on her. I love her. Maleeha Lodhi, Pakistan’s Ambassador to the United States during the Clinton and Bush era, and now, Permanent Representative to the U.N. She rose through the ranks of journalism and made it to the most coveted position in the foreign services. She is charming, witty, personable, and a patron of the arts. New Yorkers, see if you can get an invitation to one of the Pakistan mission events, and meet her in person. I was one of the lucky ones, here in 2015. Admire her photos. There is more on her illustrious career. By the way, she wasn’t the only female ambassador. There was Sherry Rehman, during the Obama administration. If you were watching the Academy Awards ceremony in 2012 or 2016, she is the woman who walked off the stage with the Oscar for Short Documentary. Saving Face; and A Girl In The River: The Price of Forgiveness. The first was about acid burning of young girls. The second—about honor killing—made history. When women who had ‘dishonored’ the family were killed, the victim’s family—usually the mother—would forgive the killer—usually the father or brother, and the charges were dropped. Men walked away with murder. That was the price of forgiveness. After this movie received international acclaim, the laws were changed. Murder was then re-categorized as a criminal offense, which makes it a case for the state, with no room for forgiveness. That is IMPACT! Go girl! Keep making those movies. Isn't she beautiful! Enjoy reading all about her. Now that’s a name you have heard. She died last month, and what a loss. We know that she was a human rights activist, but did you know that she was also the President of the Bar Association of the Supreme Court of Pakistan? A woman! What does that tell you! It tells me that the male lawyers accepted her leadership. Now that’s worth celebrating. Did you know that she was put behind bars for her activism? She was fighting for the restoration of democracy against the military regime of Zia, when she was imprisoned and had to leave the country and live in exile in Geneva. When Zia was killed in a plane crash in 1988, she was back, and at it again. She co-founded and chaired the Human Rights Commission in Pakistan. My son Asim and Asma marched together—in the streets of Lahore—protesting against child labor. Asim had spent a year in Pakistan doing human rights’ work. Asma served as the United Nations Special Rapporteur on Freedom of Religion until her death in February. She was the go-to for women’s rights. Women fleeing oppression, sought refuge with her. She high-profiled their cases in the press, fought for their rights, advocated, and endured death threats. Asma died last month of a brain hemorrhage. At her funeral, held in a stadium in Lahore, women walked up to the front row and stood side-by-side with men for the funeral prayer. This was unprecedented. Traditionally, women in Pakistan do not attend the funeral prayer. As women moved to the front, no one stopped them. Men watched, and let it happen. Days later, the right-wingers spoke up, denouncing it; but guess what! Too late. Asma had made her mark in death. Here is more. And some photos. Need I mention Benazir Bhutto, twice elected Prime Minister of Pakistan (we have yet to elect one); Malala Yusufzai, Nobel Peace Prize recipient; the hundreds of NGO leaders, the artists, poets, anchorwomen, journalists, writers, academicians, military strategists, politicians, doctors, entrepreneurs, business women; and my sister, a lawyer at the Supreme Court. Women of Pakistan, celebrate today and give yourselves a big pat on the back.